Puerto Vallarta offers visitors a world-class shopping experience. The variety of products available for purchase are as rich and diverse as the area’s history and culture.Within the Banderas Bay area there are numerous shops, boutiques, art galleries and luxury shopping malls featuring original and specialty items that will both amaze and delight you. For savvy shoppers who enjoy the back-and -forth banter of bargaining with shopkeepers for the lowest prices on vacation souvenirs, then beach vendors, kiosks, flea markets and eclectic roadside stands are where the fun begins. Prices are listed in pesos with tax already included. The majority of shop owners and vendors are bilingual. Many upscale stores offer international shipping options. If you are looking for everyday products, clothing or household items, there are stores everywhere that cater to local consumers, offering both regional and international brands at reasonable prices.There is both a Sam’s Club and Walmart in Nuevo Vallata. In Puerto Vallarta there is Costco, Home Depot, a Sam’s Club/Walmart complex, and an additional Walmart in the Los Sauces neighborhood of PV. If you are staying downtown in the Romantic Zone, shop for fruits, vegetables and meats where the locals shop: Emiliano Zapata Market on Lazaro Cardenas. Refer to the Romantic Zone Map. Farmers Markets are also fun venues for outdoor shopping. There are several farmers markets in the Banderas Bay area to include two in Puerto Vallarta, one in Bucerias, one in La Cruz, and one in Sayulita. There is also a very popular fish market in La Cruz de Huanacaxtle (North Zone) where many of the area’s restaurants obtain their fresh catch-of-the-day menu items. The photos below are of the Old Town Farmers Market along Basilio Badillo in the Romantic Zone. This popular Saturday farmers market has now changed venues and is located at: Parque Lazaro Cardenas on Olas Altas, kitty corner from Daiquiri Dicks beachfront restaurant. 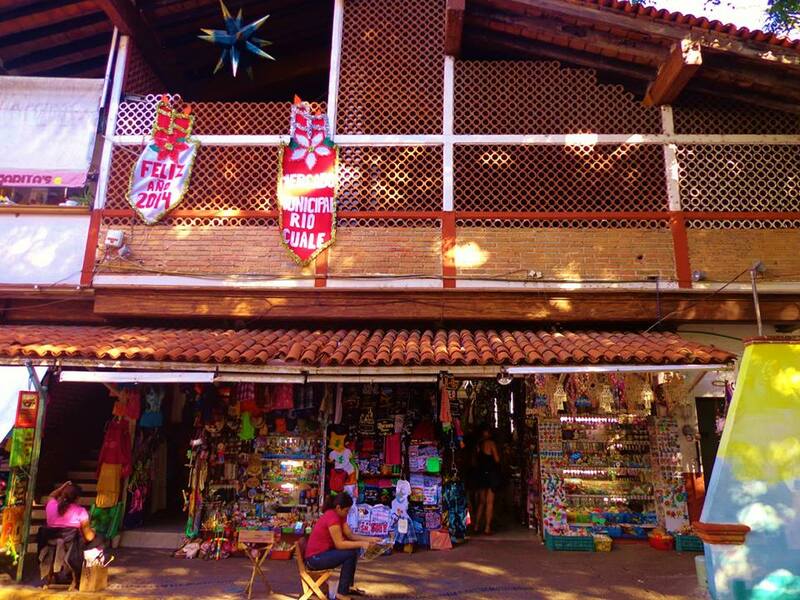 This lovely two-story shopping mall has numerous upscale clothing boutiques, jewelry stores, an art gallery, book store, the state of Nayarit’s tourism office, several shops with colorful Mexican handicrafts, and an arcade. There are a few restaurants to include Nopalitos Mexican Food, Moon Star Café, and La Jungla Restaurant & Disco. Its food court offers McDonalds, Dominos Pizza, and Subway, along with a large two-story children’s play area. At the other end of the mall is Baskin Robbins, Adan & Eva Juice Bar, Buonnissimo Ice Cream, and a deli. There is also Sunset Market, a large supermarket which has a great selection of American brand groceries. Additionally, there is Starbucks, Banamex Bank, a laundromat, the US Consulate, real estate offices, and San Javier Hospital’s urgent-care medical clinic (open 24 hours, 7 days per week). The location of Paradise Plaza shopping center is included on the Nuevo Vallarta Map. Bucerias Flea Market in Bucerias, Mexico. The photos above do not do this market justice. I apologize for not having better photos of it, but the good ones are on my camera’s missing memory card. Just know that this market is really large and colorful, the prices are good, and the vendors are friendly and helpful. This wonderful and large flea market is located right next to the town square in Bucerias (it borders the south side of the town square). This flea market is open every day. The wide selection of artisan products sold at the Bucerias Flea Market are pretty much the same items that are sold at the flea markets in Puerto Vallarta. Shoppers can usually negotiate a price that is similar to or even less than the prices offered on the same items in Puerto Vallarta. From Nuevo Vallarta heading north, you can take a leisurely walk up the beach to Bucerias. From any one of a number of newly remodeled beach access points you can easily enter the town. However, if you don’t mind continuing to walk past several of the beach access points until you reach the beachfront Gordos/Fat Boy’s Restaurant, right next to that eatery there are stairs leading directly up to the main town square and the Bucerias Flea Market. Visitors from Puerto Vallarta can easily reach Bucerias Centro by bus, taxi or rental car. It’s definitely worth the trip! La Isla Rio Cuale can be easily reached from El Centro by walking the ocean-front pedestrian bridge that crosses over the Rio Cuale just south of the main section of the Malecon, north of the Romantic Zone (see photos above of the stairs leading down to the small island from the pedestrian bridge). This small island has a huge variety of flea market kiosks and stalls, as well as several wonderful restaurants where shoppers can take a relaxing break from the day’s activities and enjoy a nice meal along with cool drinks. A hanging bridge on the north side of the island, about mid-way down La Isla Rio Cuale, leads directly to Puerto Vallarta’s huge Municipal Flea Market building. Municipal Flea Market Rio Cuale (Mercado Municipal Rio Cuale) in Puerto Vallarta, Mexico. This 2-story flea market is just north of the Rio Cuale at the intersection of Libertad and A. Rodriguez, and it is bounded by Insurgents Street on the east. Multiple entrances are found on all sides.This flea market is quite literally a shopaholic’s dream. Here you will find an amazing array of small independent shops and stalls that offer clothing, jewelry, colorful handicrafts, leather accessories, souvenirs, and so much more. Once you show an interest in an item, bargaining for the best price begins. If you’ve been looking for a particular item that you cannot find anywhere else, there’s a high likelihood of finding it at this flea market. The very same souvenirs offered at the large resort hotels will be found here, but at much better prices. Those shopping with pesos will score much better prices than those shopping with US dollars. Contrary to what the situation was in the past, USD are not sought after! Vendors prefer that all purchase transactions be made in pesos. Mundo de Cristal is one of our family and friends’ favorite places to shop and purchase souvenirs. You can view their location on the Romantic Zone Map. They have an amazing array of unique and colorful blown-glass items such as drinking glass, specialty glasses, pitchers, vases, stir sticks, glass hearts, wall decor, decorations for the home and office, as well as a large inventory of lovely hand-painted ceramics for the kitchen and home. If you’ve often admired beautiful glassware at various restaurants throughout Puerto Vallarta, Mexico, it’s very likely that those items came from this store and/or the blown-glass factory that provides its inventory. And what’s extra special about this place is that they can fill special orders. If you can give them a drawing of what type of blown glass item you’d like, such as colorful Margarita glasses, etc., you can make a special order for them. Note: For special orders there is a minimum quantity that must be ordered, which I found to be very reasonable. So if you are planning a wedding or another special event and want to design favors or glassware that are one-of-a-kind, this is the store that can help you with that. Take a peek at their website for more photos of the beautiful items they offer. Emiliano Zapata Market in the Romantic Zone of Puerto Vallarta, Mexico. 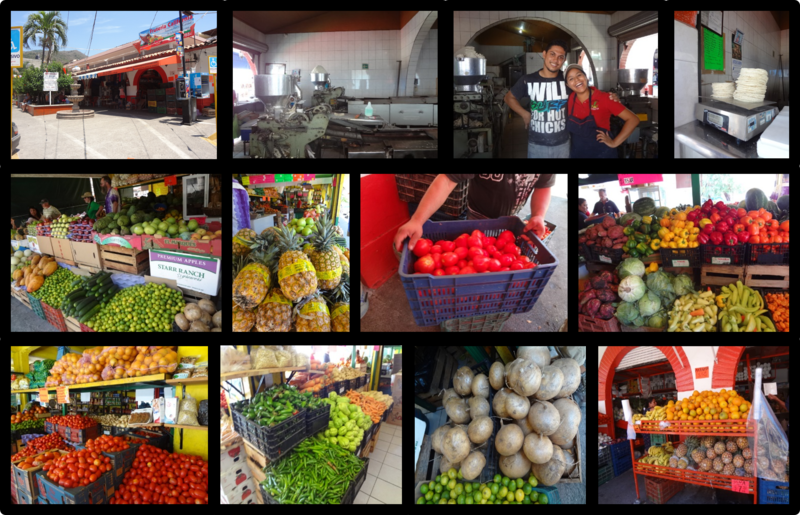 If you are staying downtown in the Romantic Zone, gorgeous fruits and vegetables can be purchased at bargain prices at the Emiliano Zapata Market on Lazaro Cardenas. Refer to the Romantic Zone Map. At this market there is a wonderful tortilla factory, butcher shops, a florist, and places to purchase household items. This is where the locals shop, and prices on all items are excellent. And for delicious cheap-eats options, there are a few small restaurants within this market that serve comida-corrida-style meals (a series of courses cooked in a home-style fashion and served at a reasonable cost). 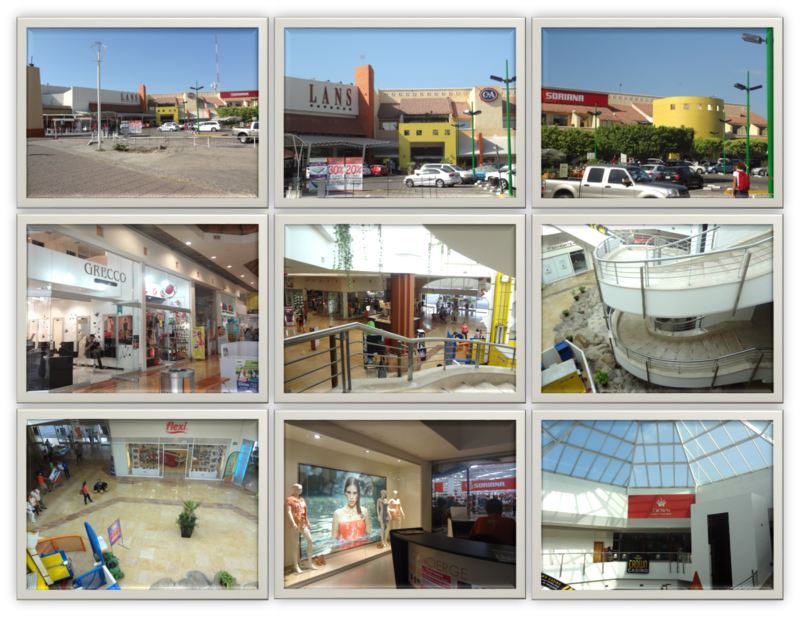 Located next to the Walmart/Sam’s Club shopping center, Galerias Vallarta is a beautiful upscale shopping mall. Its high-end anchor department store is Liverpool. This mall has a lovely Cinemex movie theater, Starbucks, a variety of women’s clothing and shoe stores to include AG, Prada, Hang Ten, Nike, and men’s stores to include Undercolors of Benetton, Pepe Jeans London, etc.There are children’s clothing stores, beauty salons and beauty supply stores, and several accessory and cosmetic retailers.There is a GNC health store, Game Planet, Radio Shack, and cell/internet/cable providers such as Telcel. There is a pet store, furnishing stores, a toy store, sunglasses store, jewelry store, optical store, and several miscellaneous shops. A food court is located on the second floor, and there are several restaurants within this mall to include Chili’s Restaurant whose tables by the window have an excellent view of the Puerto Vallarta Maritime Terminal. Located in Puerto Vallarta’s Hotel Zone, Plaza Caracol is across from the Fiesta Americana hotel and halfway between Walmart and the giant sports park at the northern edge of downtown PV. Plaza Caracol is a wonderfully comprehensive shopping center with a very glossy and modern section of the mall blending in seamlessly with a much older and established section. From the frontal view it definitely looks like a good-sized shopping center, but my goodness, looks are deceiving. This place is not only good-sized, it’s really huge and expansive! Plaza Caracol offers more than 300 stores, with it’s anchors being Lans department store, Soriana grocery store, and Cinemex movie theater. With approximately 300 stores, offerings at Plaza Caracol include Cinemark Theater with six screens, Lans department store, Soriana supermarket, Crown Casino, over 20 restaurants and eateries, an internet café, arcade, women’s shops, mens’ clothing stores, children’s clothing stores, beauty salons and beauty supply shops, accessories and cosmetics retailers, health stores, photography stores, furnishing stores, veterinarian, Bancomer Bank, money exchange services, gift and party stores, a bookstore, laundromat, flower shop, luggage store, dance and fitness studio, musical instrument store, massages, sunglasses outlet, keys and services, electronics and video game shops, cell phone/internet/cable providers to include Telcel, Nextel, etc., plus several other miscellaneous retailers. The year-round Saturday Market Co-op located inside the Paradise Community Center in Puerto Vallarta, Mexico. A photo on the top row shows the jewelry artist from whom I purchased a super cute pair of earrings. A photo on the bottom row shows my wonderful friend Becca purchasing a cute and comfortable pair of leather sandals. Situated in the heart of the Romantic Zone, right across the street from Coco’s Kitchen, this excellent Saturday Market Co-op has a lot to offer: Organic fruits and vegetables, breads, baked goods, a nice assortment of freshly-prepared foods, flowers, crafts, jewelry, purses, cute clothing, home décor and so much more! Everything sold at the market is baked, handmade, or grown by local vendors. When you arrive, you can sit down at a table in the shade and relax while enjoying a light breakfast of freshly baked pastries or a breakfast burrito along with juice, a smoothie, coffee or tea. Or partake in a delicious lunch. There is always a great selection of freshly-prepared foods available to enjoy on the spot or to take home for dinner. This is one of two Saturday markets in Puerto Vallarta, but this is the only one which operates year-round, and offers shade to protect you from the elements. Additionally, this site offers vendors more stable and complete facilities to prepare and display their food items for sale. But both Saturday markets are within an easy walking distance from one another, and offer visitors a fun, lively and customer-friendly shopping experience. We encourage you to stop by both locations on your Saturday morning route through town. The Old Town Farmers Market is one of Puerto Vallarta’s favorite weekend attractions. This market features “make it, bake it, grow it” selections, including farm-to-table produce, herbs, flowers and artisan foods such as oven fired breads, baked goods, salsa’s and dips, jams, jellies, chocolate, organic coffee, locally made Mexican & Italian cheeses, fresh pasta, quiche, meat pies, perogies, Greek yogurt and more. There is also a wide assortment of unique arts & crafts made by local producers: custom-made bathing suits and sandals, jewelry and accessories, greeting cards, home accessories, hand rolled cigars, tinctures, all-natural skincare products, Huichol art and traditional Mexican musical instruments. Many talented local and international performers are on the live-music schedule. Days/Hours: Wednesdays from 9 a.m. – 1 p.m. during the high-season months. Starts mid-November and concludes after the second Wednesday in April. Forever Spring Farmer’s Market was formed 5 years ago as a charity and community event held weekly at the BBCC in Bucerias. They are currently based out of the Rosa Mexicano restaurant and their next door neighbor Happy Shrimp, a location near the beach. Both restaurants have gardens and offer a quiet and friendly location with on-street parking and clean bathrooms. Totalling over 80 vendors , the market is going from strength to strength with charities being offered free or subsidised spaces. Charities we support are Investours, the Childrens Library of Bucerias, the BBCC, Tercera Edad and the JO Food Drive, Madre Selva and the Prison of Tepic. Wonderful food, art, crafts, jewelry, glass blowing, finger painted tiles, rugs and table cloths/bedspreads and much more are sold between 9 a.m. and 1 p.m. every Wednesday. This shopping venue aims to have live music during the market to create a wonderful ambiance with indigenous music. Forever Springs Farmers Market supports entrepreneurs in Bucerias and within the surrounding area. Please come out and support this fun and lively market and purchase from hard working Mexicans and foreigners who have made Banderas Bay their home. We have over 75% Mexican businesses, plus some Argentinos, Europeans and N. American/Canadians. The market’s focus is on quality and ethical trading. Days/Hours: Sundays from 10 a.m. – 2 p.m. during the high-season months. Commences annually on the first Sunday in November. This Sunday market is held along the La Cruz Marina boardwalk, extending from the La Cruz Mercado (the La Cruz Fish Market) all the way down to Oso’s Oyster Bar. One of the most expansive farmer’s markets in Riviera Nayarit, there is now a waiting list for vendors. Enjoy a fantastic selection of colorful artisan offerings, clothing, shoes, organic remedies, lotions, artwork, jewelry, fresh-cut flowers, and so much more. And come hungry as this market offers organic coffee, a variety of yummy baked goods, and a huge array of food offerings as well as delicious fresh-squeezed juices. Directions to La Cruz Sunday Market from Puerto Vallarta heading north on Hwy 200 to the town of La Cruz de Huanacaxtle. (The same location as the La Cruz Fish Market.) This map is provided courtesy of Oso’s Oyster Bar. How to get there from Puerto Vallarta: Head north on Highway 200. Take the off-ramp heading west to La Cruz de Huanacaxtle / Punta Mita. Drive past two Pemex gas stations and an OXXO market. Look out for signage indicating “Oso’s Oyster Bar” and turn left. Follow the road Atun all the way down until it ends and curves to the left turning into the street Zulcetas. From Zulcetas make your first right and drive down a short distance until you see Oso’s Oyster Bar. The farmers market runs from Oso’s all the way down to the La Cruz Marina. This is a very small town and it’s hard to get lost. But if you have a question, just roll down your window and ask a local for directions! After spending the morning hopping at the Mercado Huanacaxtle, we highly recommend stopping by Oso’s for their delicious ceviche and a cool beverage. This is the La Cruz Fish Market in La Cruz de Huanacaxtle, Mexico. You must first pass by Oso’s Oyster Bar before entering the parking lot to Mercado del Mar. 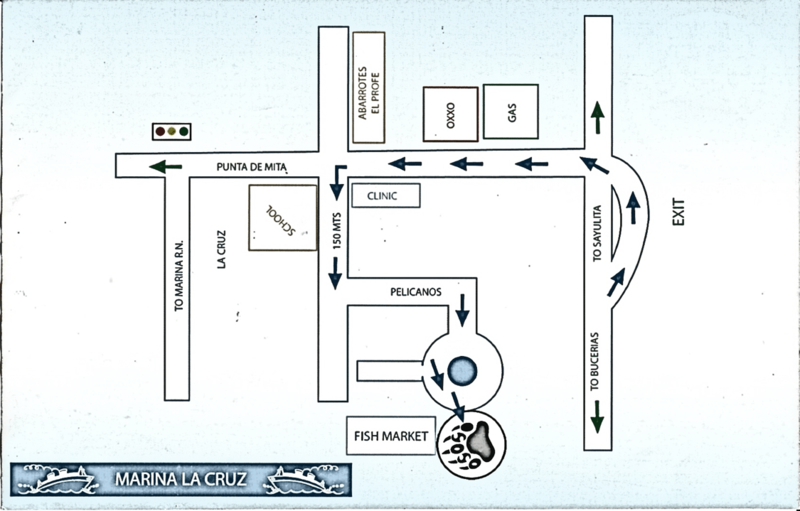 For visual directions to the La Cruz Fish Market, see the map above under the heading “Mercado Huanacaxtle / AKA: La Cruz Sunday Market”. The La Cruz Fish Market is open every day all year round. Restaurants from all over Banderas Bay come here to purchase their “catch of the day” menu offerings. This is a very busy market, so for the best selection of fish, shrimp and other seafood options plan to arrive early, before 9 a.m. A fun day to come is on Sundays, when the La Cruz Sunday farmer’s market is occurring at the same time at the same location. Tip: Although a small red snapper would seem like the perfect purchase for one or two servings, please never buy small red snapper as this just encourages fisherman to continue to pull tiny juveniles out of the sea which prevents them from maturing, multiplying and re-stocking the ocean. Mercado del Pueblo is Sayulita’s only farmer’s market, and is located in the heart of downtown Sayulita, on the north side of the bridge. This market features organic produce, yogurt, cheese, bread, pickels, coffees, baked goods, pestos, soups, natural animal food, soaps and lotions and much, much more. Below is the schedule for cruise ships arriving at the Port of Puerto Vallarta, Mexico. Seasoned visitors to Puerto Vallarta know that during the days the cruise ships are in port the prices for souvenirs are often much higher than normal. When the vendors have a large flow of customers filling their stands they are not inclined to sell their beautiful wares at the lower prices that tourists are normally able to bargain these items down to when the influx of visitors to Puerto Vallarta is not as great. When two or three cruise ships are scheduled to be in port at the same time, many of the adventure tours tend to sell out fast so it’s best to plan accordingly when you have your heart set on experiencing specific tours and adventure activities during your vacation. Port of Puerto Vallarta Cruise Ship Schedule 2014. For your convenience, we translated the Spanish wording on the original document into English.